If you are like most people, you’ll probably need a dental filling at some point in your life. Dental fillings are one of the most common treatments performed at Grand Dental Center. A dental filling is a restoration used to repair minor to moderate tooth damage. We may recommend a filling if your tooth has been damaged by tooth decay (for example, if your tooth has a cavity), or if your tooth suffers from minor fracturing or chipping. The dental filling is used to restore the tooth to its original structure and function and to return your smile to good health. We offer two types of dental fillings: amalgam fillings and composite fillings. Composite Dental Fillings are ideal for patients who have minimal decay or minor cosmetic problems. The dentist applies a tooth-colored resin that matches the color of your teeth directly to the tooth and sculpts it into form for an invisible restoration. In most cases, tooth bonding procedures are complete in a single visit. 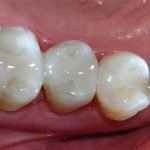 Resin dental fillings can be very long lasting when properly cared for, but do not last as long as a porcelain amalgam filling. Dental amalgam fillings are a very durable, safe and least expensive material used to a fill a cavity. Made from a mixture of metals, it is estimated that more than one billion amalgam fillings are placed by dentists annually. Many patients prefer dental amalgam to other alternatives because of its safety, cost-effectiveness and ability to be placed in the tooth cavity quickly. The process for placing a filling requires just one visit to our office. 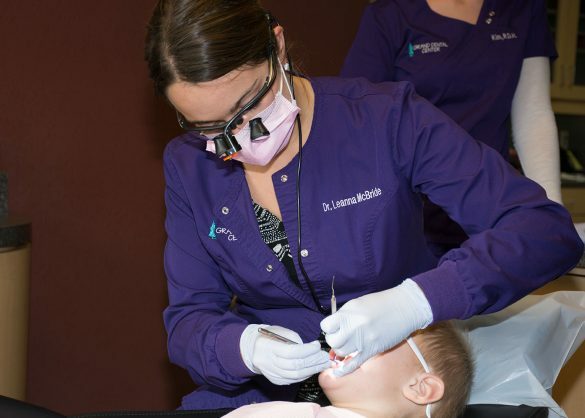 Dr. Johnson or Dr. McBride will first remove the decayed and damaged portion of your tooth, and then clean the tooth to remove all traces of decay. We then fill the tooth with the filling material and shape it to match your tooth’s shape. Finally, the filling is hardened for a lasting restoration. If your tooth is decayed or damaged, a dental filling is likely a great choice for restoring your oral health and function. Call Grand Dental Center at 218-326-0339 to schedule an appointment today.